Most of the previous items that I have described in the daily ‘Countdown to the Release of the Film “Suffragette”‘ posts over the past month have already been sold – but for this final week I shall describe items that are currently for sale. 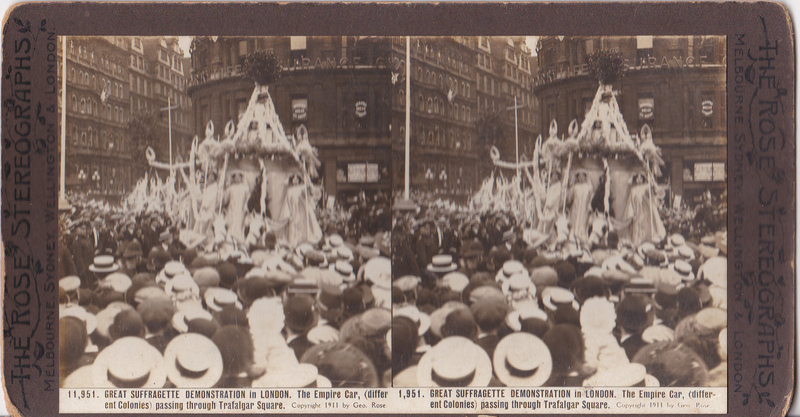 This is a stereoscope photograph of ‘The Empire Car’ – one of the elements of the ‘Pageant of Empire’ that was included in the procession staged by the suffrage societies on 17 June 1911 to mark the Coronation of George V.
To stage the procession the Women’s Social and Political Union, the Women’s Freedom League and the National Union of Women’s Suffrage Societies worked together, alongside a wide range of smaller societies – bringing together militants and constitutionalists in one grand, consciousness-raising display. This particular image is interesting, for with the imminent release of ‘Suffragette’ there has been a minor flurry on Twitter deprecating the lack of inclusion of women of colour in the film and particularly citing a couple of images, such as this, as evidence that supporters of the movement did include women from India. That is true. However the handful of wealthy, aristocratic Indian ladies who were supporters lived lives far removed from that of Maud, the East End laundry worker whose story is central to the film, and there is no plausible reason why their paths should have overlapped. Indeed, there are thousands of women – including all the members of the NUWSS – whose stories do not feature in the film. This in no way detracts from the engrossing story of Maud Watts, whose fictional life makes explicit to us just why it was that women did need the vote. This entry was posted on October 8, 2015, 9:53 am and is filed under Collecting Suffrage, Suffrage Stories. You can follow any responses to this entry through RSS 2.0. You can leave a response, or trackback from your own site.